How to Set Default Batch, Batch, and Product Settings. It's suggested that you bookmark this page and the eBay Common Errors document in the event that you need to refer back to these pages if you encounter any issues. To get a better understanding of their restrictions and causes for errors please view these links. eBay restricted items and eBay listing restrictions. 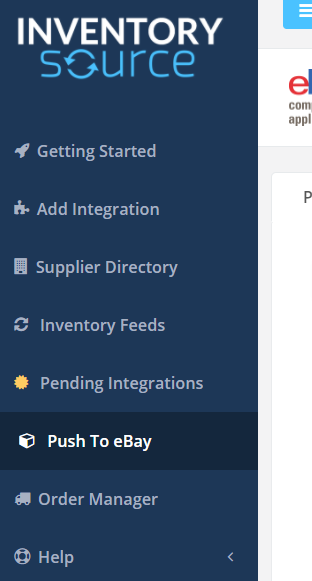 Once you have a subscription with a supplier using Inventory Source, the Push To eBay is available once you "Add an Integration" for a supplier to eBay. Sign in to your Inventory Source Account. "Add an Integration" for your supplier to eBay. Once purchased, you now have acces to the "Push To eBay" tool. Select “Push to eBay” located on the left-hand panel of your dashboard. There you go you're already halfway there! When you access the tool you'll notice that a note will be showing that looks like the screenshot below. 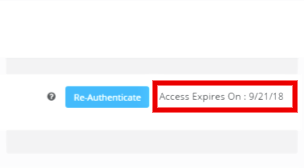 Authentication means that your Inventory Source account can connect to your eBay account to push products up to it. You must authenticate your account before you are able to create any batches or load any products to your eBay account. Your eBay authentication will eventually expire. This means that you will need to re-authenticate it. You can see the date of when you'll need to do it again as shown below. If you’re just getting started, you should know that when pushing products to eBay it’s best to place your product choices in batches so you’re not pushing all products at once. A batch is a group of products that fit a specific niche or category. It’s easier and faster to push 25 or so products at a time rather than pushing hundreds or thousands of products at once. So we suggest you separate the products you want to put on eBay in ‘Batches’ of similar products. If you don’t have any existing batches, click “Create New Batch" in one of two places as shown below. Fill out all of the information in every batch setting category from 'General Settings' to 'Shipping, Tax, & Returns.' Make sure that you also select a Shipping Method Service when setting that up. Once you set all of that up it will direct you to your main Push to eBay dashboard. Select the Batch that you just created and now it's time to add items to this batch. Once you click the "Search & Add Products to Batch" you will then see your suppliers product directory and you'll notice we supplied you with four searching and filter tools to help you filter the products faster to put in your batch. 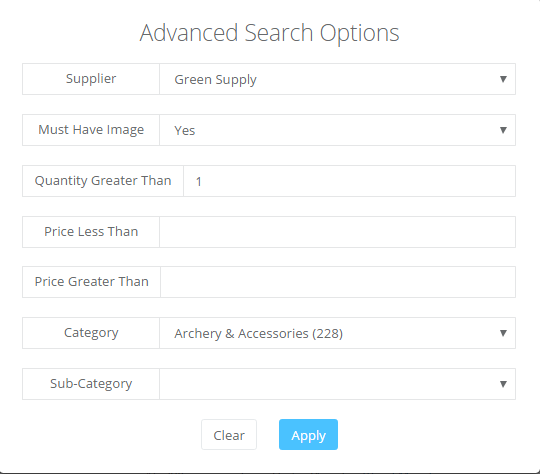 Advanced Search and Filtering tool: We suggest using this filter to help narrow down by suppliers categories and by your qualifications that you would require for the products that will be added into this batch. How to Add a Product to Your Batch? As you go through the product listings you’ll be able to decide which products fit your product batch niche requirements. 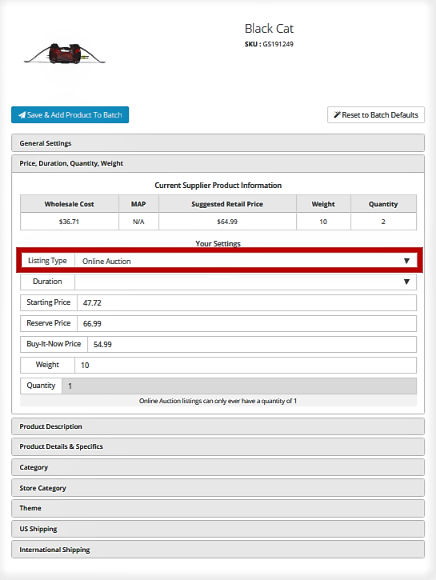 When adding products your have the option to add products in Bulk or Individually depending on if you want to view and critique each product before adding it to your batch. As you can see it will allow you to see the product information as well as edit the title and subtitle of the item, the product description, add specific details such as features that may be of use to know to your customers, as well as the shipping information for that individual product. You can add as many products to a batch as you want, however, we suggest keeping product categories similar in the same batch. For example, don't mix chocolates, sneakers and fishing rods in the same batch unless you have a particular reason for doing so. Once you're satisfied with the items in your batch and you're ready to push them to eBay, you must first validate and view the products fees. To do this, select all our products by pressing the button right under the products pictures you'll see 'Not Selected' once you select them it'll show as selected. 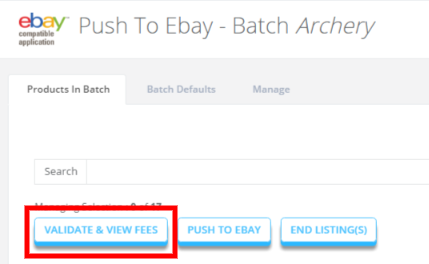 Once all items are selected, press the "Validate & View Fees" button up at the top of the batch products. This will adjust the prices accordingly to the batch settings and the product settings you've set during the whole create and adding process. Once all products prices are set and adjusted you can them that batch to eBay by selecting the button up at the top that says "Push To eBay". Although, you setup your settings for each batch when you’re creating them you are able to set settings that are unique to all of your batches, which is considered your default settings, as well you can set settings for just one product. The way that the our Push To eBay tool works is that everything trickles down to the product level. What that means is if you set your default settings all batches will be set to those settings, as well as any New products added to the batch or products that have ended and you relist them, they will inharit those settings. However! If products are already listed in the batch when you set your default batch settings they will not apply to those items. 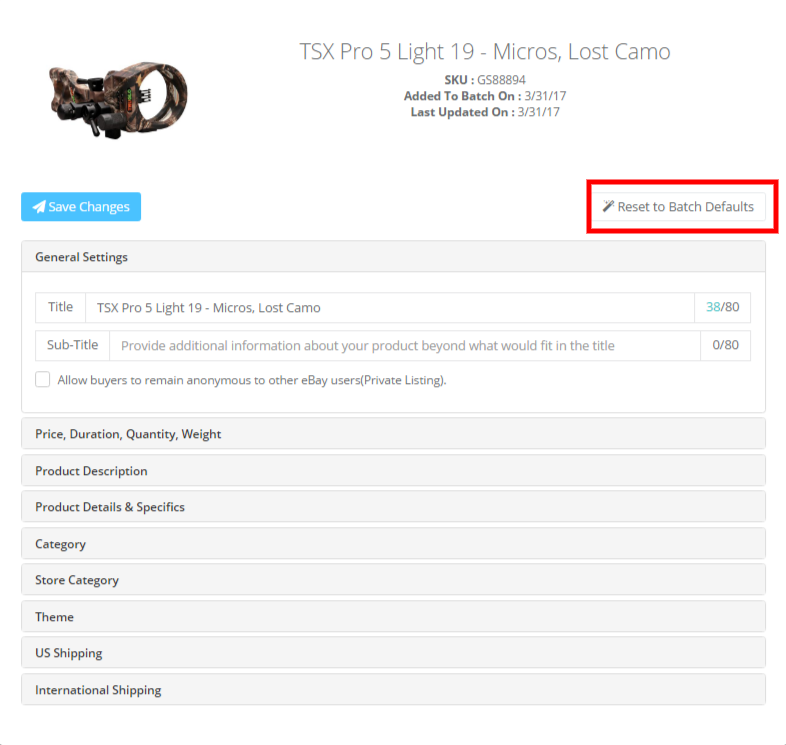 You will have to either wait until the listing has ended, or select the products that are within the batch individually select "edit product details" and then select the "reset to batch defaults" as shown in this image. If you’re wanting to make it quick and easy to push products to eBay, we suggest setting your default settings to mimic the pricing, shipping, and taxes to reflect the most accurate information that would fit your suppliers requirements and your selling goals. What this means setting your preferences on how you want to handle your listings when a product goes out of stock, setting a default category, or store category, setting your default theme, pricing settings, payment options, your shipping, tax information, and return settings. These default settings will be used if you don't alter any settings for each individual batch. When you create your batch you have the chance to customize your settings to best fit that product niche. Even after you create the batch you can still alter the settings that you’ve previously set anytime you want. Just try to fill out all settings as complete as possible. There are two pricing options when you are setting up your batches that you can choose from; you can use a fixed pricing strategy or a auction pricing strategy. Fixed Prices - This section lets you specify a fixed price general rule to determine the pricing and duration of a product being listed for a fixed price option. For example, if you generally sell your products at a 15% markup on wholesale, this is the place where you can set that. For a few products which you sell at a higher markup, you can always do the editing at the product level. 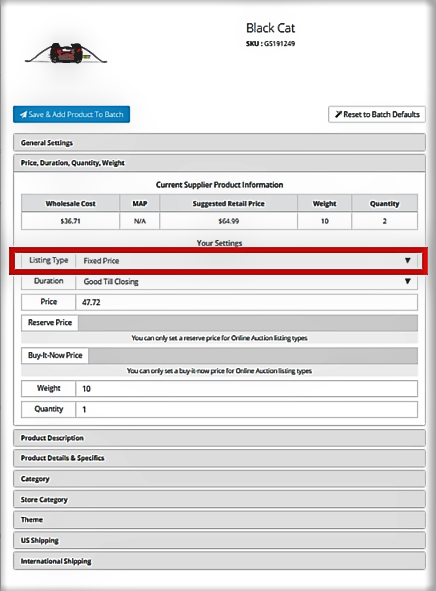 Auctions - This section lets you specify a general rule to determine the pricing and duration of a product being listed for an online auction. For example, if you generally sell your products at a 15% markup on wholesale, this is the place where you can set that. For a few products which you sell at a higher markup, you can always do the editing at the product level. Starting Price - This is the base starting price for an auction. Setting the starting price is important for customer’s perception. When it’s low, buyers generally believe they’re getting a deal, even if they’re not certain what the reserve price is. Reserve Price - This is private unless you make it known in your listing somehow. This is the price that bidders must reach in order for you to be satisfied enough to actually sell and ship the product. If the reserve price is not met, the seller will not sell the product and can re-list it for a new auction. Buy it Now Price - Before an auction begins and before the auction price is bid up to the reserve price, you can give your customers the option to purchase the item at a set price (which is generally set at a higher price). In some cases you're not going to want all items to be set at your default price. Sometimes you'll want a specific item to be priced differently from the rest of your batch. This can be done very simply. When looking at the details for this specific product, you'll be selecting "Listing Type": "Fixed Price" This can be changed per item if you desire. Just change the price as desired. You also can set the auction price for an individual product as well by changing the "Listing Type" to: "Auction Price"
You will notice that the prices are set according to the default settings set prior when creating this batch. You can alter it as desired. You can also set a specific item to “My Store’s Fixed Price" which would set this item's price to the price set by your batch pricing settings. There are three different types of themes that can be used on Ebay - "Store Themes", "Batch Themes", and "Product Themes". We provide you with multiple eBay themes that can be found when setting your default batch settings, under "default theme". We have provided you with 7 theme categories that you can look through to choose which one you'd like to use. If you'd like to know what the check mark means click here. Your product theme is configurable in your Inventory Source account. This is a theme that applies to batches of products or individual products. You can use the pre-set options available in the Ebay store (there are hundreds available) OR you can use a custom theme. As long as the theme is HTML, you can use a custom theme. For Batches of Products - You cannot add a custom theme for batches, but you can choose a pre-set theme. Click on the batch, then click "Set Batch Defaults", then click "Default eBay Theme". 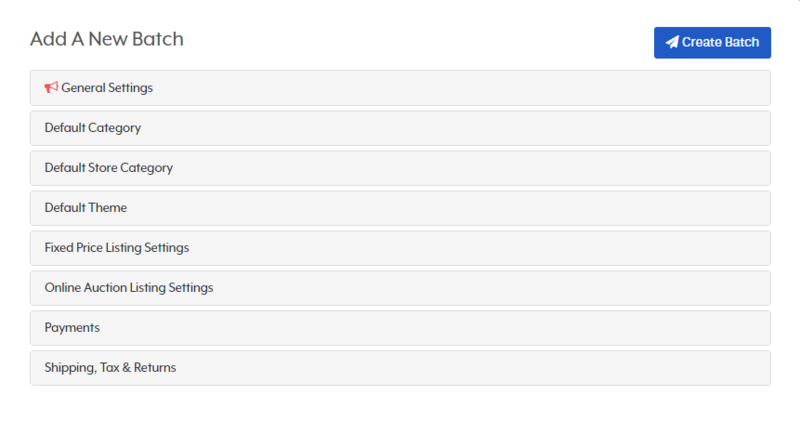 Now select a category of themes and choose the final eBay product theme that you want to select. Be sure to click "Save" to save your changes. For Individual Products -You can add custom themes for individual products. 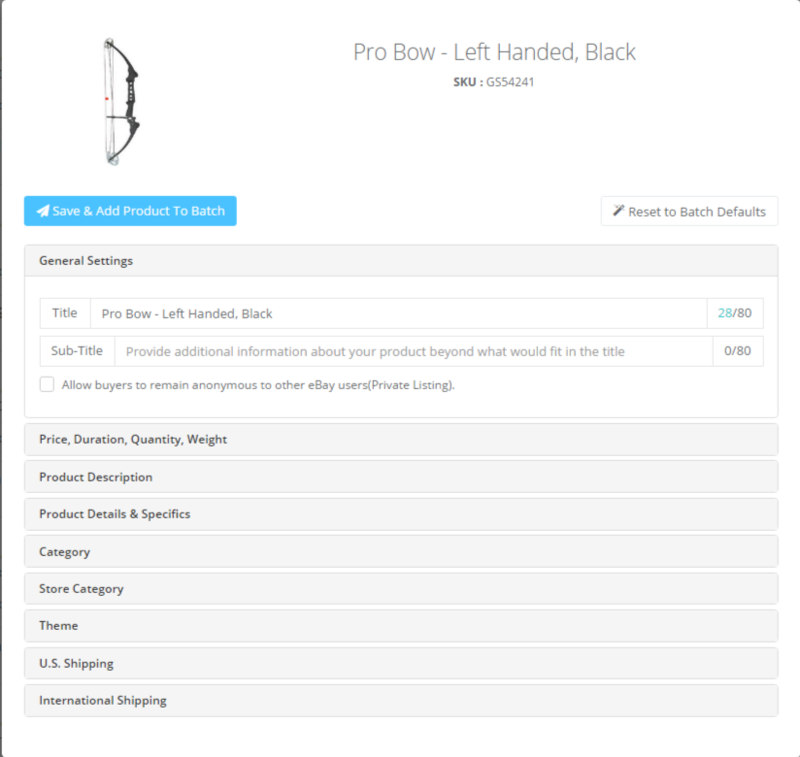 After a product is added to a batch, you can click “Edit Product” and go to the “Describe the Item you Are Selling” Tab and then click the small square “HTML” Button (located right below the word "Description") - this will allow you to upload custom HTML and therefore alter the look of the product listing. Under payment settings, you only want to check off the payment options. For example, if you’re going to be accepting payment through Paypal, whether from other Paypal or by Credit Card on paypal, then only check off the Paypal. Do not check off the other options, because they require additional settings and will prevent you from being able to load products via Push To Ebay. You must choose at least one shipping option. You can set up to three shipping options as options to the users when they checkout. Additionally, you can give free shipping on any option by simply placing zeros in the price fields. Sales Tax - if you leave it empty, no sales tax would be applied on your eBay sales. Returns Policy - this is important to set. The default is 14 days. For more information about "Standard Shipping" and how eBay categorizes shipping options, please visit our FAQ section below. Once a batch is deleted, it cannot be undone. Be certain that you want to delete the batch. If you get the above error that does not allow you to delete your batch, this means that you have active products still in that batch. A batch cannot be deleted until all active products are ended. You must end active products from within your InventorySource Push To eBay account. You can do this while you're in the batch, by selecting all of the active products (you can tell which one is active by the indicator to the left of the product title), right under the products pictures you'll see 'Not Selected', select all of those that are active and then click the “End Listing” button at the top of the page. This will end the listing(s). Now you will be able to delete the batch. Note: if you manually delete the products from your ebay.com account, this will not allow you to delete the batch if the batch still has active products. 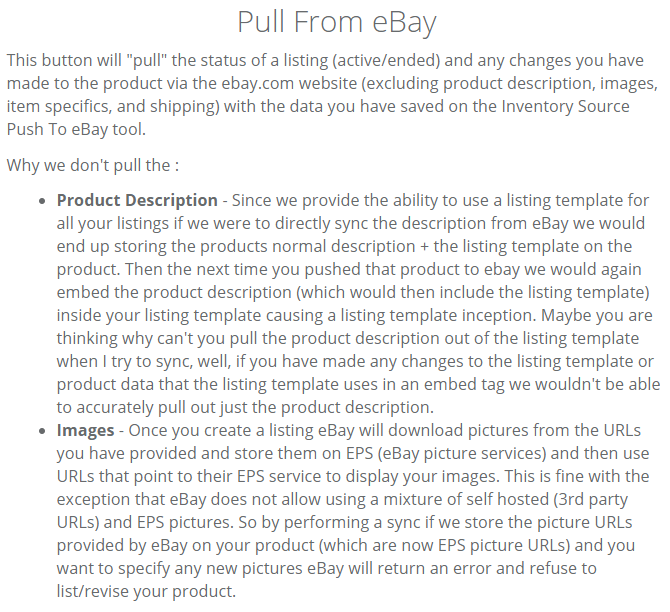 You will still need to end the listings inside of the Push To Ebay tool page. If you're wanting to rename a batch, select the batch that you're wanting to rename and go into the "Manage" Tab. You will see the batch name and just rename it there, once you're done press the "Update Batch Name" button. Once a listing has been pushed to eBay you can edit them if it's a fixed price listing. However, all edits may not be available. If you're wanting to make full edits you may have to unlist the products and make your edits and then relist that product. With Auction listed items you can only edit before someone bids on it. Click the settings area that says "Product Details & Specifics"
Please note, in the Name field, you are literally typing the word Brand with a capital “B”. You are NOT putting the brand name in this field. Is it possible to change to a different eBay account? Yes. Just re-authenticate your account and switch over to the other account. Be aware that if you switch over to a new account, our software will sever the connection with the original eBay account and will no longer update the products in that account. Be 100% certain that you want to do this. Additionally, it's advisable to end all of the listings on your original eBay account prior to doing this - otherwise you risk customers ordering items that are out of stock with the supplier. Just know if you try to edit the products on your other account or list the products that you already have listed on your other account, you can't relist them on your newly added account. Basically, you can't list the products on both sites, you can only list different products on each site. Can I use more than one eBay account? You can only have one eBay account per InventorySource.com account. The reason is that our system maintains a direct connection to your eBay account to update those listings on a daily basis. If you connect to a second account, our system loses the original connection and your products will no longer be updated. What is the difference between "default categories" vs "store categories"? If you are a current eBay user and are assigned a "store front" through eBay. In your eBay account back end you can form categories to categorize your items to your liking, these are called "store categories". Our Push To eBay tool fetches the categories that you manually set in our store and you can categorize your batches in your specific set batches. As well you can list your products in eBay's default categories that are just their general categories that you can see online. So one is to organize them how you wish on your eBay's "store front " site how you'd like. The other is for you to categorize them in eBay's general. Can I change the quantity of items? You can change the quantity to whatever you want. 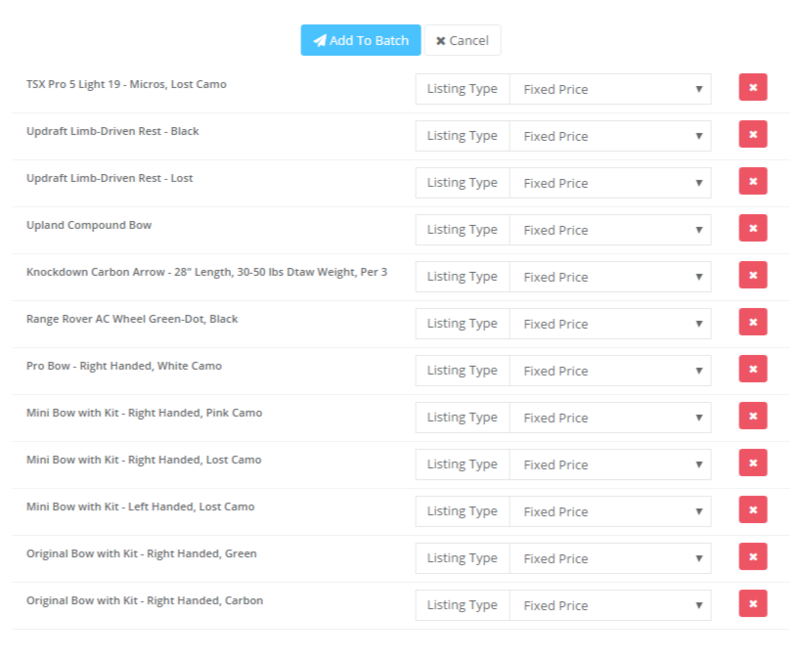 You can do so by clicking "Edit Product Details" then going to "Price, Duration, Weight, Quantity, Dimensions. If you decide to change the However, there are two considerations with this. First, if the supplier only has one item in stock but you've changed the quantity in the listing and customer orders more items than the supplier has in stock, then you are going to have a problem. You will need to cancel the order or only partially fulfill the order. This could result in a bad review from a buyer on eBay and maybe even jeopardize your selling privileges. Second, no matter what the quantity in stock is - when the supplier quantity reaches "0" then our software will take your eBay listing offline. The purpose is to prevent orders that cannot be fulfilled - so this saves you a lot of time and prevents potentially unfulfillable orders. Last - it is generally suggested that you don't change the quantity of items. If you change it, you risk encountering more potential issues than there are potential advantages to changing the quantity. Only under very specific situations should you consider changing the quantity. On my new eBay account, I get some Free Listings. Why am I currently being charged $0.30 per listing? Shouldn’t this be free? 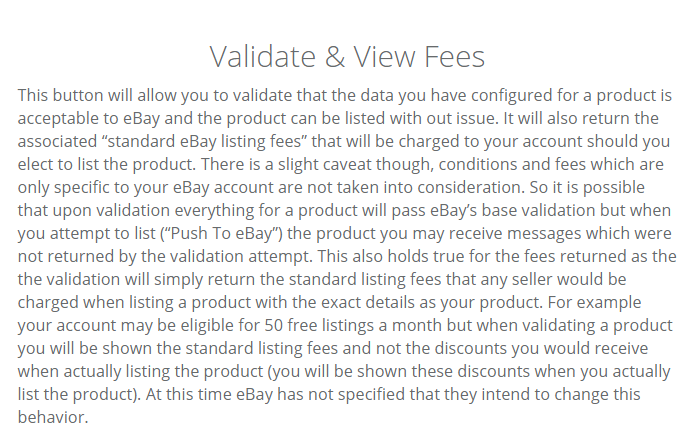 Your eBay account will not be charged for free listings, however, you will still see the “$0.30 Listing Fee” note in the software. Our eBay software has no way of identifying free listings, so it simply posts the same pricing for each listing, regardless of their true fees. Additionally, these listing fee’s are charged by eBay. Inventory Source does not determine which listings are paid and which listings are free. Why does the quantity in stock not accurately reflect that of the supplier? The listing fee you pay to eBay depends on the quantity in stock, in addition to other factors surrounding the listing. For example, if there are 500 items in stock, you're likely going to pay a higher eBay listing fee than if there are only 5 items in stock. To reduce this cost to you, we automatically mark products to a quantity of 1. If our software did not do this, then you would pay significantly more for your listings. You are able to change the quantity to something else but the amount must be lower than what the supplier has in stock. Several of our suppliers have products with thousands of items in inventory. This would be expensive to you. Note: You can not change the quantity of those the prices of those that are Auctioned. How can I offer free shipping? Free shipping is a popular option on eBay. To offer free shipping, you’ll essentially be putting $0 in for the price, similar to this. Keep in mind - this does not mean the shipping is free to you, the seller. Your supplier is still going to charge you a shipping fee. So if you offer free shipping, make sure you mark up your product pricing enough to cover shipping - otherwise you may actually lose money! Why is my shipping option not showing on the item page on eBay? It's important that you contact your supplier directly to determine which shipping options they offer. Once this is determined, you will then be able to decide which options you prefer to offer to your eBay customers. Using FileExchange, can I manually bulk load products to eBay? Yes, definitely. We have a different service for this. This is called our "Custom File" service. In order to manually load products to eBay, we have a service where we can create a Custom File for you. We will build a file that you can download on a daily basis to upload your products. You will essentially login to your Inventory Source account, download a file that we generate for you and then upload it to your eBay account. In this file, all your specific product pricing will be updated daily to reflect the pricing settings you've put in place. However, please know that our Custom File service is slightly less efficient and more time consuming out Push To Ebay Tool. We developed our Push To Ebay software to make things more manageable. What should I choose for my Category? The best way to choose a category for your product is to learn how similar products are categorized on Ebay. By doing a quick eBay search for similar products to the item that you want to sell, you can see how they are categorized. Then, once you determine the best category, you can select that category for your product. What does the checkbox mean when categorizing my products? When you are categorizing your products to be pushed to eBay, you’ll need to ensure that your product reaches the end category. eBay’s product categorization branches out into different category and subcategories. When you see the check box next to the category listing name that is the final category level. What is the difference between Default Settings and Batch Settings? Every product you post on eBay has certain settings, such as payment settings, shipping settings, selected categories, and so on. With our different levels of settings, you can more easily control your product settings. Default Batch Settings - applies to all batches and all products in all batches. Batch Defaults - applies specifically to the specific batch. Product Settings - applies specifically to the selected product. This setup is a more powerful way for you to manage your listings. Otherwise, you would need to set these things for each individual settings. So instead of doing that, you can simply set your Batch Default Settings, and those settings will apply to all of the products in your account. Why are my product settings not updating when I change batch level settings? In the last question (see above) we discussed the three different levels of settings that can be set for products: Default Batch Settings, Batch Defaults, and Product Settings. These are important to understand for this question. Batch settings are applied to products when the products are newly added to the batch. If you add a product to a batch, it will "adopt" the parent level settings. However, if you then change the batch settings (parent level settings in this case), then the product settings will not change. Our system does not update child settings when parent settings are changed. This means that you will need to remove the items from the batch, change the batch level settings, then re-add the products to the batch again in order to see the new changes. It helps to have consistent products in batches. For example, if you are selling watches with a 40% markup, don't put them in the same batches as backpacks that have a 20% markup. You want to separate the products out by type, category, and markup. That way if you want to change your batch price markup settings, you can do so more easily. Can I adjust the product pricing below the MAP pricing that the supplier has set? MAP pricing is the "Minimum Advertised Price" that the supplier sets. The supplier sometimes sets a minimum allowable sales price in order to prevent unwanted behaviors, such as resellers selling items at very low rates which can sometimes lead to the brand's perceived value being damaged. Suppliers and manufacturers are very careful about managing their brands. You cannot set the price below the MAP price using the Push To Ebay Tool. If you attempt to do this, an alert will display. How many images are on each product? Can I add my own images to my products? Currently, we only load one image per product. Our software is not designed to load more than one image. However, once a listing is active on eBay, you may log in to your eBay account and manually add more images. This can be a good option for popular products that are sold frequently. Is there a "Low Quantity Filter" for the Push To eBay software like there is with your other software? Unfortunately, no. There is no way to automatically mark products out of stock once the quantity reaches a certain threshold in the supplier's warehouse. We do offer this with our inventory automation software. However, with Push to eBay, even if the supplier only has one product left in stock, our system will claim that it is still in stock on your eBay account. In rare cases, this can lead to an issue with a customer purchasing an item that is now out of stock with the supplier. It isn't common, but it happens. The best way to check this is to know which items are sold quickly - with those items, check the supplier inventory levels occasionally to ensure they're still in stock. I’ve manually added my supplier products to my eBay account. Why are they not updating? If you manually list products on your eBay account and wish to have us sync for updates you will need to use our eBay populate integration instead of using Push to eBay. If you wish to purchase this eBay integration please specify during the 'Add Integration' process, or email solutions@inventorysource.com for assistance. After looking at our Documentation, you are welcome to submit a message to Inventory Source if you still have questions. Our knowledgeable staff is well versed in using the software and will be able to offer help with errors, problems and other hang-ups that might leave you with questions. If you have any questions or concerns about any of this information listed above please don't hesitate to ask. Login to your InventorySource.com account. At the bottom of the left-hand panel, you'll see "Help"
Under Help, click “Contact Us”. Fill in your question and submit your ticket. Our staff will respond within 24-48 hours. Please try to be as specific as possible about your question, including the Batch you are working on, which error you’re seeing, etc.